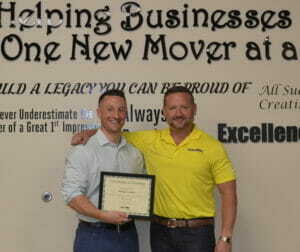 Michael J. Avallone already knows the perfect customer for Our Town America, the nation’s premier new mover marketing franchise…because he himself IS that perfect customer. Avallone became an Our Town America franchise owner after a friend moved and told him about the Welcome Package he had received. Immediately, Avallone thought that was an intriguing business concept. Avallone’s father, after all, had been a major in the army, and so Avallone knew a lot about moving as a child, mostly shuttling around cities throughout New York and Ohio. And then, as an adult, Avallone’s career in shipping logistics had bounced him around between New York, Ohio, and Florida. So, when he heard about Our Town America, a business model based on a personalized welcome package catering to new residents of a city or town, it seemed like a genius idea. And as luck would have it, about the time he heard about Our Town America, he was looking to start his own business. And then working with a business broker, Avallone learned that a franchise in his area just happened to be for sale. Which is how earlier this year, Avallone came to be the owner of Our Town America – Tampa Bay. Michael Avallone of Our Town America Tampa Bay and President Michael Plummer Jr. In fact, right now, Avallone is more like his customers than even he probably realizes. As everyone knows, moving is stressful – can be exciting sometimes, but still stressful. And so is starting a new business. As well as raising a family. Avallone has done all three within the span of a year. He only recently moved to St. Petersburg, Florida (just down the way from Tampa Bay). He just bought his Our Town America franchise and is adjusting from being a paid employee (a sales manager) for a shipping company to being a business owner. And he and his wife, Stacey, recently had a little boy named Matthew who just turned 8 months old. “I’ve literally been a mess of stress… I’m a headcase. But I’m learning, and I know it will get better with time,” he jokes, shortly after a visit with a prospective new client. Oh, he’ll do fine – and Avallone admits that he thrives on stress, and that he is very motivated to run a successful, thriving business. Plus, while his last name sounds like “alone” (if you say it quickly… okay, really quickly), he isn’t alone. First, he has a very encouraging spouse (“I can’t say enough good things about my wife,” he says). Avallone also has a very supportive team behind him. “All the folks at the corporate office in Clearwater have been so tremendously helpful at every turn. It’s an amazing group a people and they are a team in every sense of the word. I’m lucky to be a small part of that team,” Avallone says. He also gives a special mention to Mike and Julie Fisher, who owned the Tampa Bay franchise before him. And it sounds like he’s doing a great job. You can hear the excitement in Avallone’s voice when he talks about the Our Town America concept. Are you looking for the excitement of being a business owner like Michael? More specifically, an Our Town America franchise owner? If this opportunity sounds like it could be for you, learn more at https://www.ourtownamerica.com/franchise-us/.